A fourth bottlenose dolphin has died at an East Valley attraction in less than two years. A bottlenose dolphin has died at a Phoenix oceanarium, the fourth dolphin to die at the attraction in less than two years. 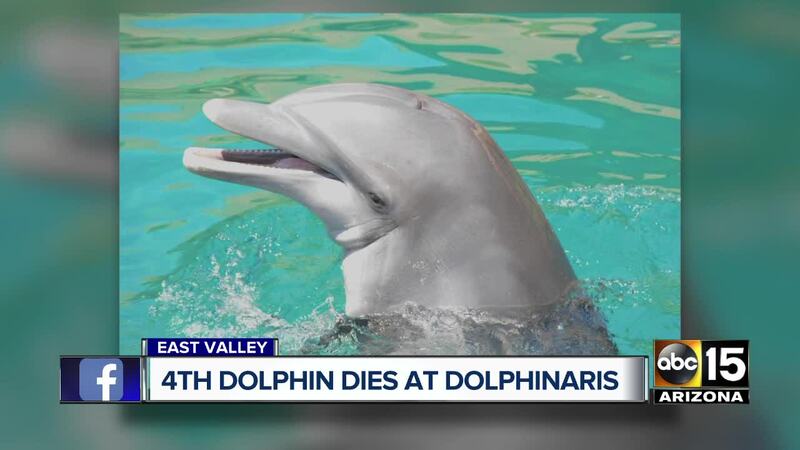 Dolphinaris Arizona announced that 22-year-old Kai was euthanized at 5:40 Thursday morning after his condition deteriorated. He had been experiencing difficulty swimming, eating, and breathing for about two weeks. Kai's death comes one month to the day after the facility announced the passing of 11-year-old Khloe on New Year's Eve. Their deaths were preceded by Alia in May 2018 and Bodie in September 2017 . "We recognize losing four dolphins over the last year and a half is abnormal," Dolphinaris general manager Christian Schaeffer said in a statement. "We will be taking proactive measures to increase our collaborative efforts to further ensure our dolphins' well-being and high quality of life." Schaeffer called Kai's death a "devastating loss" and said outside experts would assist with an investigation into his and the previous dolphin deaths. The facility has been open since October of 2016 and has been criticized for housing dolphins in the Sonoran desert since the project was announced. 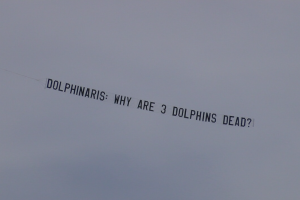 Hours after the announcement on Thursday, spectators at the PGA's Phoenix Open — currently being held near the Dolphinaris Arizona — spotted a plane carrrying a banner with a direct message to the attraction: "Dolphinaris: Why are 3 dolphins dead?" It was not immediately clear who was behind the flying display. However, the Dolphin Project wrote in a blog post that it purchased the plane and partnered with DolphinFree AZ, a local group of activists who are against keeping dolphins in captivity and have protested the facility many times. "We’re lending our support to DolphinFree AZ, a local group of grassroots campaigners in their efforts to help educate on the plight of the remaining five captive dolphins at Dolphinaris Arizona," Dolphin Project said in the blog post, which also said it would fly throughout the weekend. The blog post was subsequently deleted. A message seeking information about the banner and the removal of the post was not immediately returned by the Dolphin Project.